Hard to believe it is friday, and we are a week into March already! I am thinking and hoping this will be the weekend all this snow finally melts and spring will arrive. I find I'm much more productive in the mornings, but I'm not an 'up before the sun' kind of gal. I wanted to be motivated to take pictures everyday. I love taking portraits, but there aren't always willing volunteers, so I became the subject. 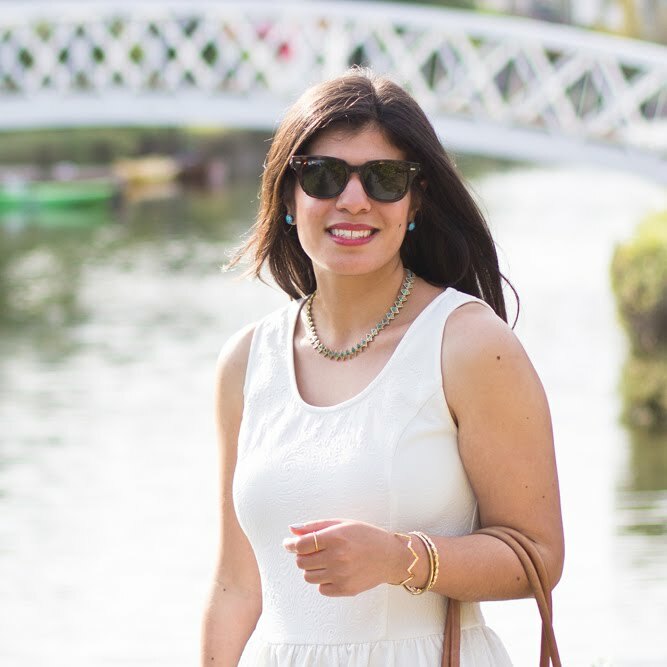 I also thought it would be fun to share all my great thrifty shopping feats! Reminding myself that I have family and friends to support and help me, no matter what I do or how big a mistake I make. If I have to give too much thought to something, it's probably because I don't want to do it. After this winter, I am feeling quite envious of the residents of Southern California. I love spring, because I am a spring baby, and when the cherry blossom trees are in bloom I'm the happiest girl in the world. However spring in New England can still be quite cold, so my favorite season is summer. I'd like to be in Europe during the time of the Renaissance, and become the subject of a famous artist's painting. Then I'd hang in museums forever and no one would know it was me. Forks with bent tines. That probably sounds silly, but I can't stand how they feel. Only one? I suppose right now it would be my thin gold ring, since I wear it nearly every day and I've already replaced it three times after losing it. It was definitely "If I Ever Feel Better" by Phoenix, but perhaps it's time for a new one. Lovely outfit!! I love that top with that cardigan. That purse is such a beautiful color, and your boots are to die for!! I know what you mean by being a morning person, but not the "before the suns up" type, haha. Mint looks so good on you, loved reading your answers. Aaand, your pet peeve is super specific, ha ha! I love the bracelets! and the print on the shirt is beautiful! Funny enough, I always thought of myself as a night owl, but as it turns out, I think I am more of an early bird. And I always thought that summer was my favorite, but then I started remembering how great spring is--finally realizing that winter is OVER! 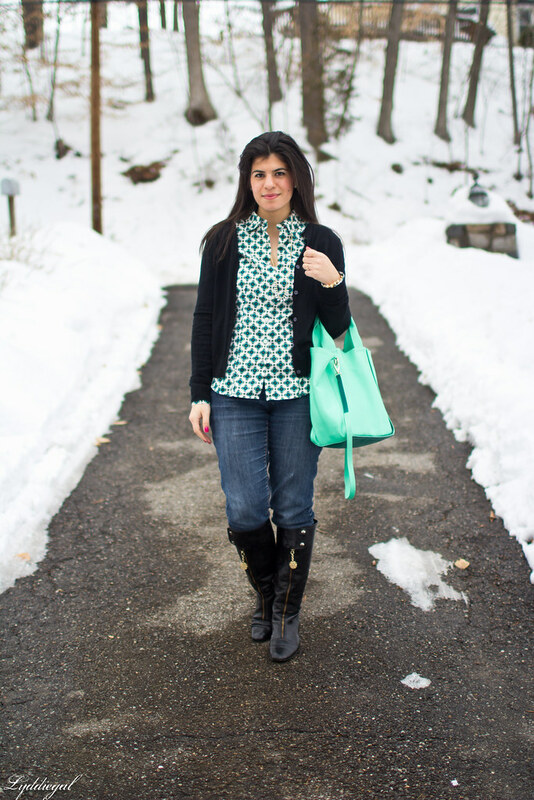 I love the mint bag! Love that top! Mint is so fresh and cute this season! What a great top, I love the print here! Yes, hopefully the snow will dissipate for you soon. It was nice to read more about you and blogging. Have a lovely weekend. 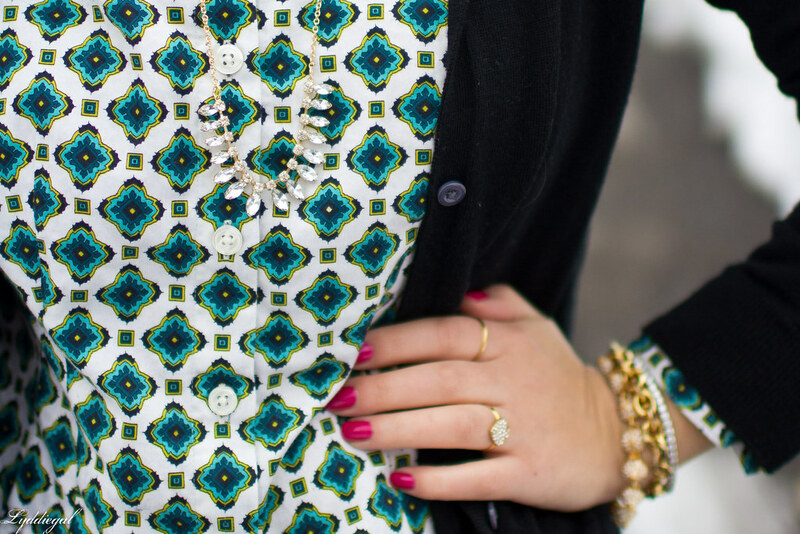 I love the print and colors on that top! Your bag is so cute and looks perfect with it! Love the color! And those boots... Super cute! Nice to know you and your blog. Love the tosca color. :) Great day to you! great qa here! 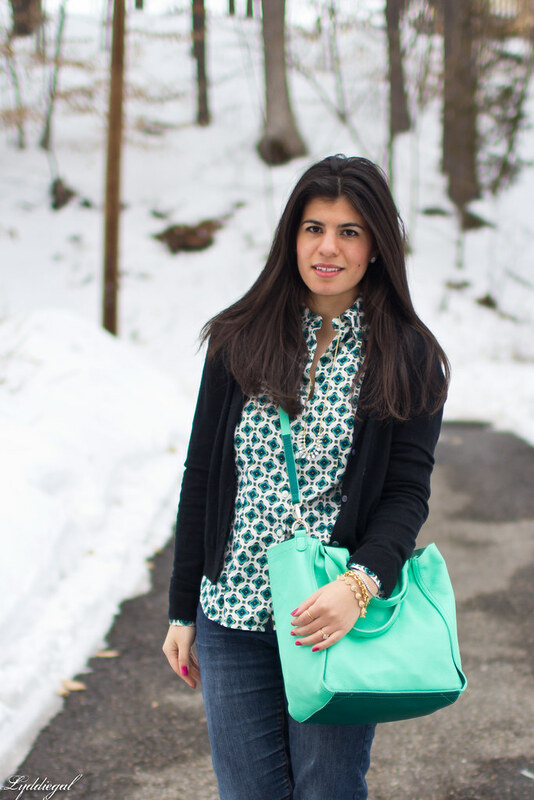 love the blouse and bag! I love that shirt and that handbag! The colors are gorgeous and so is the pattern. I love spring as well, I can wear a lot of color, and I love color. Also, I would love to travel to Europe as well. Such a pretty look, I love the blouse and boots! 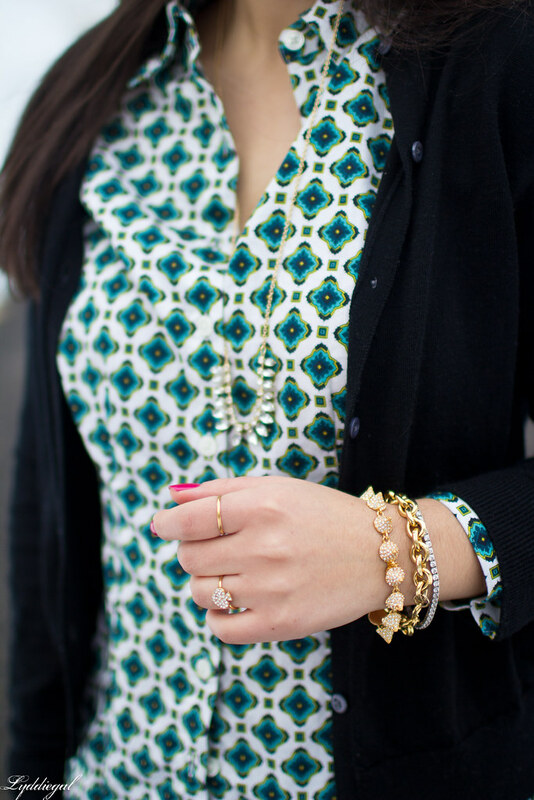 I really like this pretty printed blouse. And it goes perfectly with your bag! I am loving the bright colors! That top is perfect for spring! Oh yes, chocolate really can make one's heart flutter. I feel you 100% there, girl. Such a pretty outfit as always! 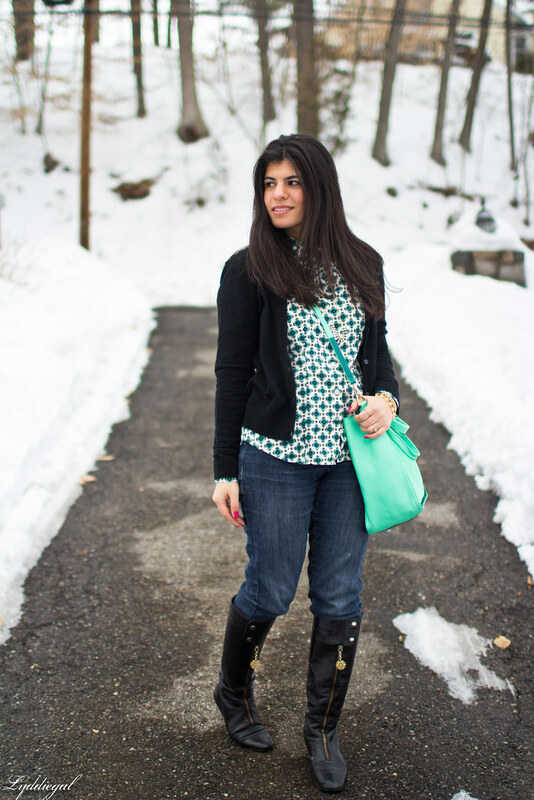 The snowy path makes such a lovely backdrop, and I adore how that aqua pops on ya! Love your blouse, gorgeous outfit!!! Europe during the Renaissance would be the coolest! can I come too?! I love that a Phoenix song is your theme song! and i agree, I am much more productive in the mornings, too! How funny - you had to be your subject for photos because people would not pose for you :/ oh they don't know what they are missing out on! I would love for you to take my pictures. I adore this look and your hair looks fab.